You might see someone just suddenly stop driving, turn to the pavement and sit down to have a cup of tea or a cup of rice wine and a deep puff on Hubble-bubble pipe. Do not be surprised, because that is a very common habit in the north. Having a bit of a chat with friends or sometimes just alone seems to be something which must be done. 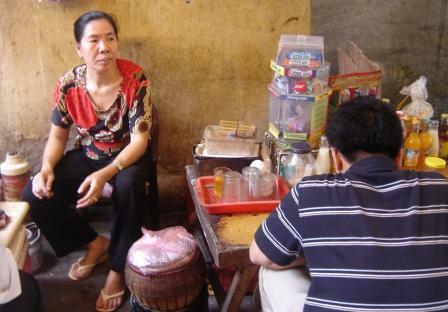 You also can have some other drinks by these old ladies who own the tiny little tea shop, which is show on a small table with some different kinds of soft drinks and a cigarette box. But the most of their income is from tea. There are quite a few different of tea as Lid Eugenia tea, Green tea, Brown tea, Flower buds tea, ect. The most common tea is Green tea and Lid Eugenia tea which is only cost you about 500Vnd or maybe 1000Vnd. 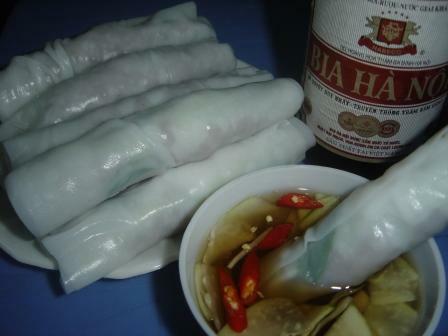 It helps your sleepy problem and old Vietnamese people love them. 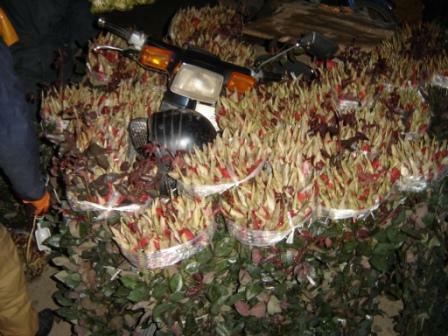 The most popular tea is from the Thái Nguyên province. 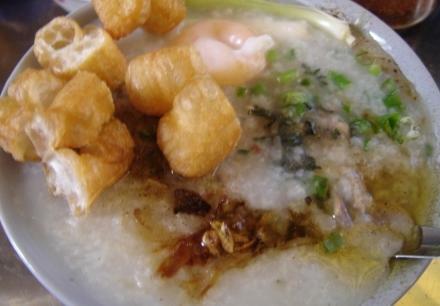 With over 18 years selling chicken porridge in the noon time and busy most of the time, this place is quite well known in Hà Nội. Even though she has a hard face, the owner is quite friendly when you talk to her. The dish is good for you anytime of the year, but it is actually better in the winter when we need hot food. There are a few options for you to choose such as: chicken porridge only, or with egg, with heart, kidney or liver. She serves it with some chopped onion, chopped perilla, and sawleaf, adding some chilli, pepper and some "Quẩy"(bread). 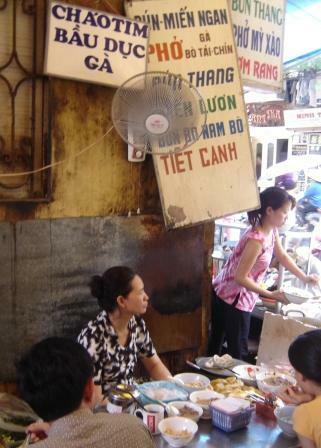 A bowl only costs you about 10,000Vnd which is just enough for your lunch, and don't forget to try from this lady in Phát Lộc lane just on the corner of Hàng Bè and Hàng Bạc street. Duck eggs are good for your health and puppies' as well. 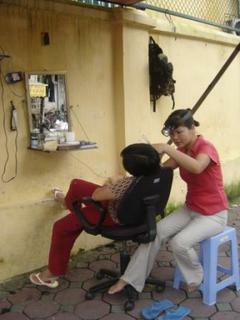 This idea maybe wierd but this is the reality in Viet Nam- Bloody popular!!! When you eat duck eggs on the last day of the month, it erases your bad luck but it'll bring you bad luck if you eat them early in the month. It's just the same as dog meat. I usually have at least six duck eggs every week but i don't really believe in any superstitions. I eat them because I like them. Some people like to eat young duck eggs but others love to eat them when they are a bit old, meaning you can see the whole baby duck with feathers, eyes and claws. 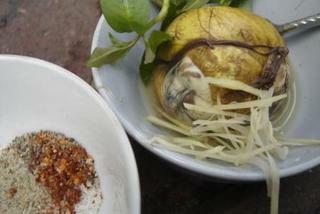 They are traditionally eaten with shredded ginger and Vietnamese mint, salt, pepper and chilli sometimes. Let's try one day and you might be surprised! Everyday at about 5 Pm, you can hear the noise "leng keng" from the street that is the rubbish hour. Not like in Australia or other countries around the world where there are rubbish trucks which mechanically pick up. In Viet Nam we still have to do it by hand, put it in a small push cart, then transfer it to another big truck and send it to the tip out of town. We still don't have any rules about public sanitation so there are lots of people throwing things anywhere they feel like even in schools and hospitals. There are some places in Viet Nam where the local peoples' committee are trying to appeal to the public to keep some districts clean but only in small areas. They have put some warning boards on the street or have written a notice on walls that threaten to fine people who litter 200,000Vnd, but I don't think it's scaring anybody. This is just raising awareness. 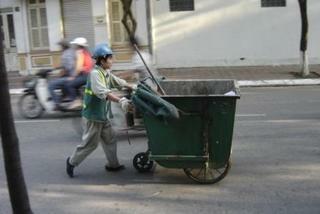 This is a big problem in Viet Nam, because awareness is still very low. They don't care about the environment and they don't think pollution affects them or other peoples' health. 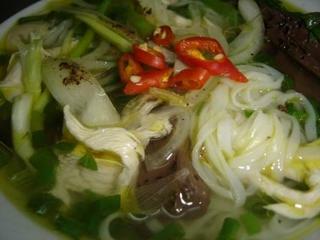 Let’s start our tour in 42 Quán Thánh Street for our morning Phở Gà (Chicken noodles) which costs about 7,000Vnd. Keep going to Ngõ Đồng Xuân where we can try the best 7000Vnd Bún Chả (Grilled pork with noodles and Asian herbs) and Phở Tiếu (Roasted pork noodles with chilli, dried onion and Asian herbs) an d a 3000Vnd Beer Hơi. Café Năng on Hàng Bạc Street is the coffee stop of your day: 5000Vnd for great coffee or juice. If you are a seafood fan, then try out the seafood around Trúc Bạch Lake, where you can sit on the pavement looking at the Lake and the action passing by. These small restaurants should only cost you about 120,000Vnd per person for crab, scallops and some shrimps. Don’t forget to check out Quất Café which is closeby, very nice and always cool with both ceiling fans and wall fans and good coffee, you'd spend about 4000Vnd. Phở Cuốn (Spring rolls) Vinh Phong at 40 Ngũ Xá is a good place to go for a snack. 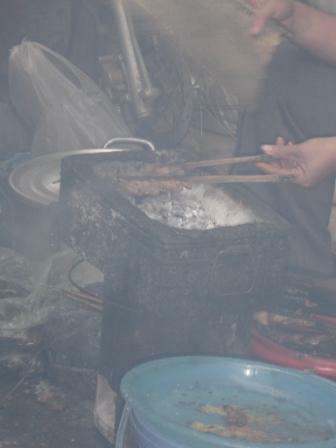 Here, they serve different kinds of Noodles, and prices start at 1,500Vnd for one spring roll. Stir fried beef and spinach served with crispy noodles is a good dish to try and costs about 20,000Vnd for 2. On your return to the city centre, try 7000Vnd Bún Riêu (Crab soup with herbs) on Thi Sách Street which is delicious, then go straight ahead and turn left to have Bánh Mỳ (Beefsteak) and Bún Bò (Beef noodles)on Hoà Mã Street. This place is always busy and you have to take good care of yourself because of the slippery floor.The owner is from Hue and prices start at 10,000Vnd for Noodles and 18,000Vnd for beefsteak. 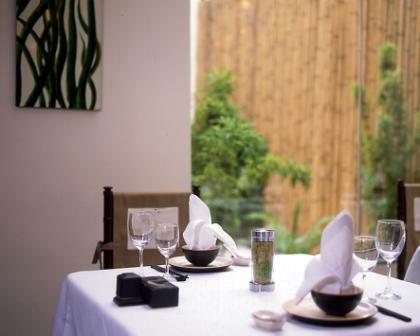 And Café Báo is a good choice near by which is quiet and has good juices. 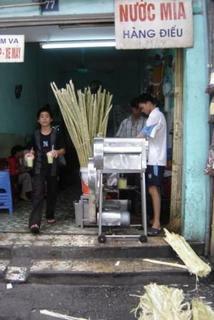 Mía Đá is good on a hot day; this is refreshing sugar cane juice and only costs you 2000Vnd in Hàng Điếu Street. Bún Bò Nam Bộ(Stir fried beef and beanshoot with noodles and Asian herbs with Southern's style) is a one dish choice for you, only 18,000Vnd. 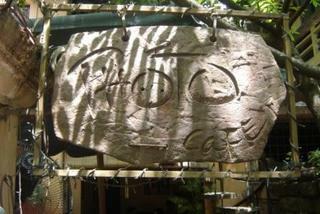 Photo cafe is a nice place to go to have a bit of a chat with friends, which is on Quán Sứ Street. There are lots of great pictures and greenery surrounding. End your day at Wild Lotus for a drink to cool you down after a long day wandering around, and then go to Wild Rice to enjoy your evening with excellent food and great atmosphere. Don’t forget to try out the soft shell crab! 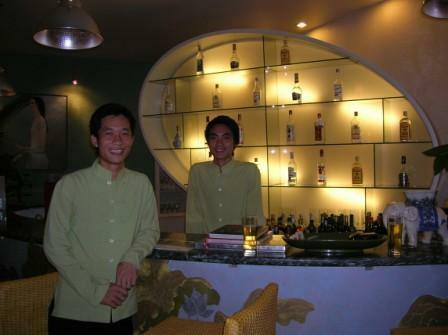 This place will cost you about 300,000Vnd for your meal but you do get what you pay for!!! Hope this information can help anyone who wants to try out the Vietnamese food in Hanoi. These places are a mix of street stalls, cafes and upmarket restaurants. Thank to Mark Lowerson from Sticky Rice for some of the nice pictures. 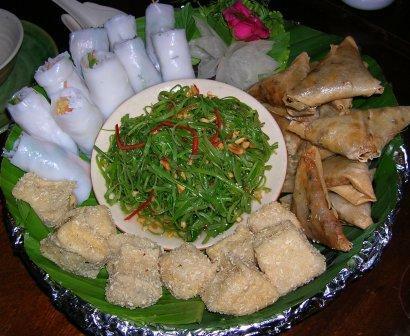 For more detail on some of the places mentioned here, visit my mate at Sticky Rice . Where did I get my puppy? 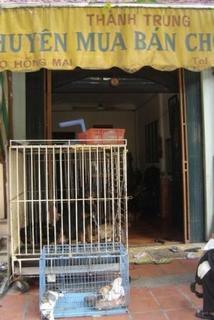 There are few places in Hanoi to buy puppies. If you are foreigners, you mi ght feel sorry for the puppies which are sitting in cages on the side of the street or inside markets. 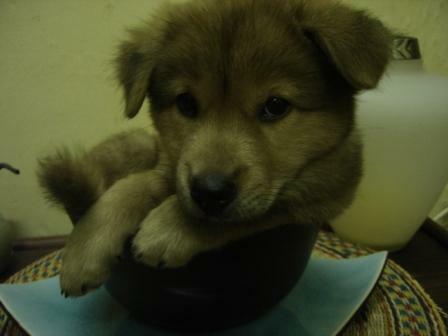 You can buy a Vietnamese puppy for 100,000 VND or Vietnamese kitten for less than that. 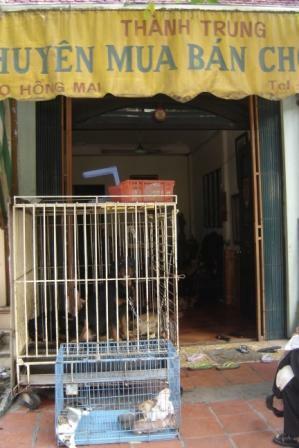 But if you want a pure breed it will cost from $100 in Hồng Mai street which is off Bạch Mai street to the left called Chợ Mơ(Apricot market). They have such a lot of different kinds of dog there. 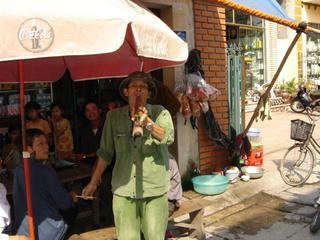 And if you don’t mind a cute mongrel dog like I have now, then go to Chợ Bưởi (Grape market) on Hoàng Hoa Thám Street. But they only open every 4th and 9th lunar day, such as 4th, 9th, 14th, 19th, 24th, 29th. 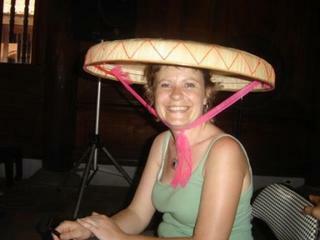 Welcome Megan to Vietnam! Yes, this is the reason why I made this party. I went to the flower market near Nhat Tan about 4 kms away from the city at 1.30Am, and I had to hire a “Xe ôm” to bring all my flowers home. 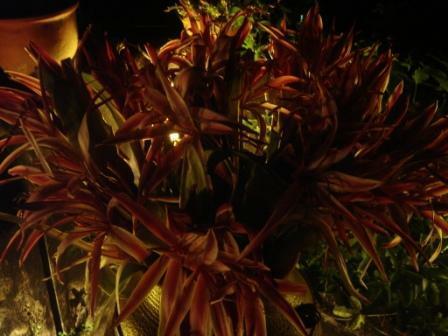 It took me 2.30 hours to put all flowers in vases, then I fell asleep amongst all the greenery. I slept for about 30 minutes then my friends Megan and Mark got home from Sapa on the late train, and it was about 5.30 Am. I felt exhausted the next day but I was really happy that I did a great decoration for my house. My party was on the roof which is full of plants, flowers, lights, BEERS and wine. I invited about 30 people to join my BBQ party. The food included green papaya salad with prawns, green papaya salad with beef, grilled pork in Russian style with a big square thick shape, grilled prawns with garlic and butter, grilled prawns with chilli and lemongrass, grilled beef with sate and lemongrass and grilled Sapa fish in wrapping paper. Food was delicious and we ended our party at 2 Am then we clean up until 3.30 Am. A happy ending! My friends liked my place, this is not my first BBQ and they seemed to had a good time. 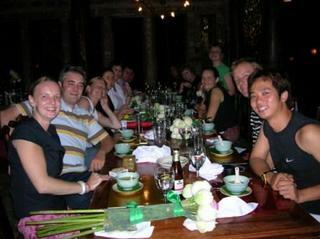 Thanks everyone for coming and share my happy time with Megan from Australia, I am sure that she had a good time here in Vietnam and in your companies. No surprise when you come to Viet nam, cheap food, friendly people and especially that you can try a cheap haircut on the street which only costs you less than $1 or $3 in the shop with shampoo and ears clean. If you able to walk around in the old quarter, there are heaps of street barber shops which they are able to speak a little bit English, but most of them can’t speak English but they might speak French. Vietnamese people who lived in the north during the war spoke French really well but people from the south speak better English, is that strange? If you spend sometime reading through the guide book, you will realize why. The Barber might not listen to what you say but when they’ve done their job, you may be surprised how good they are, of course they deserve some more for tip. Most of foreigners who come to Vietnam for the first time or even the ex-pat, they love to try this service not because its cheap, because of they are cool and good job! Why don’t you try it? 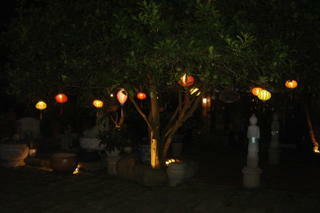 We wandered around the old house, bar and the garden and could not believe how much work they have put in on this place. The ceiling with old style roof looks so cool, lights on both sides along the house are just so special, and the lotus doors look amazing. We had a few beers at the bar, and we all agreed that the lotus and gladiola in gold vases just make it look unbelievably great. I am sure that you are not able to buy any artwork as beautiful as they have here. 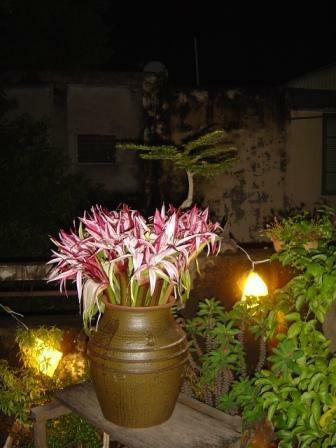 The garden is another essential feature, which includes lotus ponds, traditional stone statues and coloured lantern lighting. We start our meal at 8.30pm with a toast of French Champagne and the staff bring out the beautiful food in a combination plate, nicely decorated. 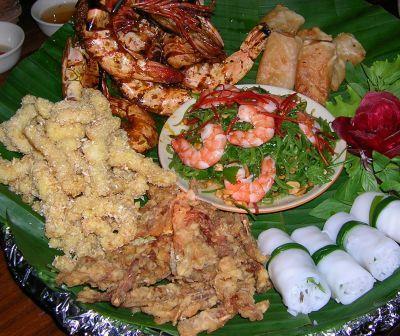 Crispy soft shell crab, grilled king prawns with chili and lemongrass, crispy squid are all delicious, morning glory and prawns salad, Ground prawn and cashew nuts fried spring rolls, and fresh spring rolls are so yummy. Afte r that we have grilled tuna in banana leaves, sauteed prawns with peanut and tamarind sauce, fresh asparagus in spicy sauce, stir fried morning glory with garlic and fried rice with seafood for our mains. All are delicious! We end our meal with tea, coffee and a sweet consomme of longan and lotus seeds for dessert. 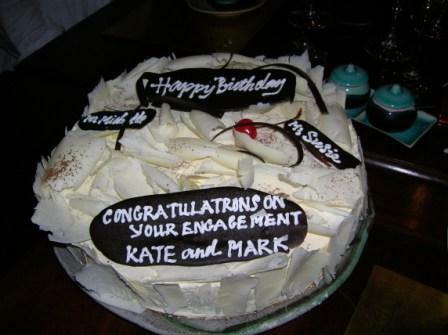 Everyone seemed to enjoy the special evening full of laughter and great atmosphere. Everything here seems to be special and perfect- Best for the Best!!! All you can do now is, give them a call or email them for further information if you are interested in getting married or having a special family meal.